Members from Muui looking at a subway station map in Seoul. Source: Muui. Imagine a world where traveling is accessible for folks in wheelchairs. That’s Kunho Kim’s vision. In 2010, Kunho went on a trip in Montana and experienced a skiing accident that left him hospitalized for four months and paralyzed from the waist down. Rather than thinking of disabled people as “tragic” or “deficient,” disability justice shifts the framework to highlight the ways in which built environments and social structures create barriers. Samuel Mendez (left) directed Muui's travel guide videos. Kunho Kim (right) co-founded Muui and 20 States on Wheels. While at Harvard, Kunho met fellow student Brad Riew. The two bonded over wanderlust and made plans for a cross country road trip for their summer break in 2014. Kunho faced the same barrier while planning their trip— travel guides lacked information about wheelchair accessible adventures. Kunho and Brad then decided that their road trip would be an opportunity to design a travel guide for wheelchair users. From that, the 20 States on Wheels project was born. With financial support derived from a combination of crowdsourcing, grants, and sponsorships, they took on inaccessibility in the tourism industry. Kunho and Brad were joined by two others, You-Myeong Kim and Cynthia Cheung, and together they embarked on a seven week journey beginning in San Francisco and ending in Boston. It spanned over 20 states with attention to 20 cities and national parks, including the Grand Canyon, Niagara Falls, Chicago, and Los Angeles. The project successfully resulted in a 400-page guidebook which is available for free online with reviews of travel attractions, cities, hotels, and public transportation. After 20 States on Wheels, Kunho and Brad co-founded Muui. Their goal is to challenge and change the social stigma surrounding disabled people. “Muui” is a Sino-Korean phrase that translates to “no meaning.” Muui wants to deemphasize disability and build towards a world where disability does not define a person and has “no meaning.” Later, Samuel Mendez joined the team and co-developed the video series concept with Kunho. "10 Days in Saigon" was directed by Samuel and features accessibility guides. Source: Muui. Muui uses educational videos to share information about accessible traveling. 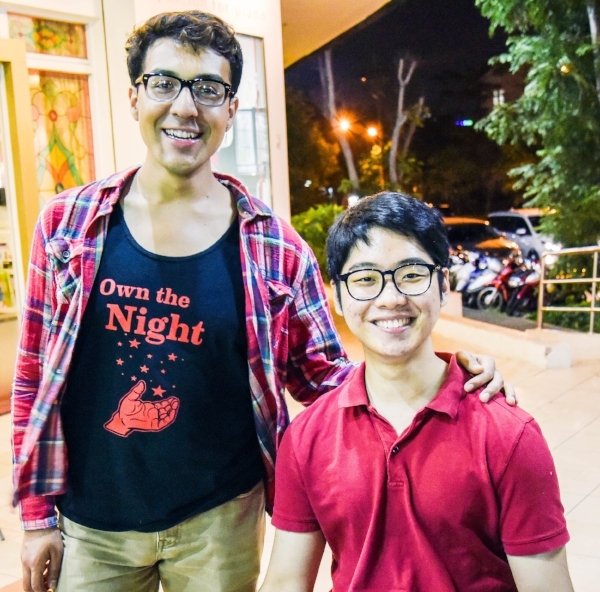 In February 2016, Kunho and Samuel began their adventures in Ho Chi Minh City, Vietnam. The goal? 10 Days, 10 friends, 1 city, 1 wheelchair. Sam documented the travels through a video series dubbed “10 Days in Saigon” which was released January 2017 over the course of ten weeks. The web-series boasts over 30 videos with subtitles in Korean, Vietnamese, and English. Each video concludes with Kunho or Sam describing the accessibility of the place explored. As the director, Sam had to decide how to portray the perspective of people in wheelchairs in a way that would show the unique experiences and challenges that come with wheelchair mobility while also celebrating travel. Ultimately, the videos rely on footage from Kunho’s perspective and it’s common to see his knees in the shots. “10 Days in Saigon” was selected for TRAVEL FilmFest 2017 and We Care Film Fest 2017. Muui’s second project is “Seoul, Take the Wheel” and was conceptualized by Samuel and created by Kunho. The third project took place in Busan which is the second largest city in Korea with a booming tourism industry. Both series present accessibility guides to tourist attractions. The video guides have received overwhelmingly positive support and Muui has received messages of gratitude for redefining disability. "Seoul, Take the Wheel" shows Kunho exploring South Korea's capital with friends. Source: Muui. Currently, Muui is mapping out the accessibility of different urban areas. Only a handful of New York City subway stations are wheelchair accessible and Google Maps doesn’t delineate which locations. Muui is addressing this problem by creating an accessible guide on Google. They are also making a route map for subways in South Korea which would be the first of its kind. Next, the team is slated to release content about the National Sports Center for the Disabled in Denver, Colorado and adaptive skiing. Follow Muui’s projects on their website, Facebook or YouTube. The 20 States on Wheels guidebook is available here.